Ideally located near the Westside Pool on Forest Street and down a small footpath is where you will find Sistah. On the first floor, there is a small furnished screened-in porch that welcomes you into a modernly decorated living room with a queen size sofa sleeper, dining area, and a kitchenette (no oven) and bath (shower only), as well as a stackable washer/dryer. Upstairs, the second floor opens into a spacious queen bedroom with a gas fireplace and a private full bath with a Whirlpool tub. 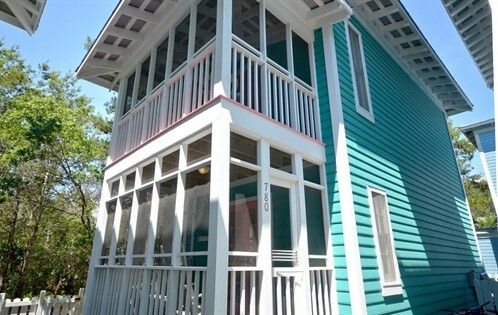 Also on the second floor is a furnished screened-in porch with a swing as well as an open side balcony to make it just that much easier to relax and enjoy the air in Seaside. For more pictures of Sistah, click here.